The Revenue Cutter HUGH McCULLOCH, also referred to simply as the McCULLOCH, served with Commodore Dewey's fleet at the Battle of Manila Bay. This small, very lightly armed vessel was unusual in that she was not a U.S. Navy ship, belonging instead to the Department of the Treasury's Revenue Cutter Service. The U.S. Treasury Revenue Cutter HUGH McCULLOCH was on a round-the-world shakedown cruise as tensions between the United States and Spain were on the rise. When she arrived in Singapore the vessel was ordered to join the Asiatic Squadron, where she would be of some service to Dewey and would be under the protection of the fleet. HUGH McCULLOCH reached Hong Kong on April 17, 1898. With the outbreak of the war, the Asiatic Squadron steamed for the Philippines. The night before the battle, as the American vessels passed El Fraile Island at the entrance to Manila Bay, soot in the funnel of the HUGH McCULLOCH briefly caught fire. The plume of flame in the night acted as a flare, alerting the Spanish of the arrival of the American fleet. The previously silent Spanish artillery on the island opened up on Dewey's vessels, but the fire was ineffectual. At about the same time, as the temperature in the engine room rose to about 170 degrees Fahrenheit, HUGH McCULLOCH's chief engineer, a somewhat portly man, suffered a heart attack, collapsed, and died. Though the general engagement of the Battle of Manila Bay had not yet occurred, he could be considered its sole American fatality. Because of her light armament and lack of armor, HUGH McCULLOCH was left to defend the Asiatic Squadron's critical supply vessels NANSHAN and ZAFIRO in the middle of Manila Bay while Dewey's warships engaged the Spanish fleet. Following the battle Dewey dispatched HUGH McCULLOCH to Hong Kong, where she arrived on May 4. 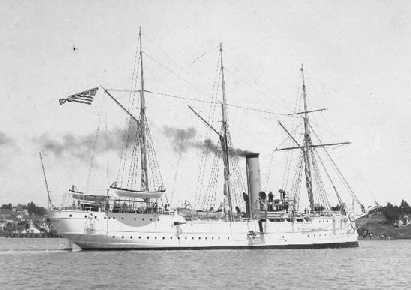 She was sent to allow Flag Lieutenant Brumby of the OLYMPIA to cable Dewey's report of the engagement to Washington. Various newspaper reporters also took the trip to file their reports. HUGH McCULLOCH soon made a second trip to Hong Kong, bringing Philippine Insurgent leader Emilio Aguinaldo back to the Philippines. By the end of the year, Aguinaldo was leading an insurrection against U.S. occupation of the islands. In the weeks following the battle, HUGH McCULLOCH served as a patrol vessel in Manila Bay , stopping vessels entering the bay and acquainting them with the restrictions of the American blockade. While performing this duty, HUGH McCULLOCH captured the Spanish gunboat LEYTE which had been hiding in one of the rivers and was trying to make a run to escape the bay. On July 5, Dewey boarded HUGH McCULLOCH to make a personal reconnaissance of the German position at Mariveles, near the entrance to Manila Bay. The Germans had been defying the blockade and seemed to be creating deliberate provocations. At Mariveles, they had established an unauthorized base. Eventually, as trouble with the German forces continued to escalate, Flag Lieutenant Brumby was ordered to take HUGH McCULLOCH and stop the German warship CORMORAN, which had entered the bay in violation of the blockade without obtaining permission. The HUGH McCULLOCH chased the CORMORAN, finally firing a shot across her bow to convince her to stop. On August 13, 1898, HUGH McCULLOCH took part in the final attack on the City of Manila, which resulted in its capture. During this brief encounter, she was stationed off the entrance to the Pasig River. HUGH McCULLOCH left Manila Bay on November 16, and arrived in San Francisco on January 10, 1899. She operated out of that port, patrolling off the Mexican coast. In 1906 HUGH McCULLOCH was sent to Alaska to enforce fur seal regulations, operating in the vicinity of the Pribilof Islands until 1912. She also served as a floating courthouse for some remote areas. In 1912, she returned to San Francisco and her patrols off the Mexican coast. HUGH McCULLOCH was transferred to the U.S. Navy on April 6, 1917. On June 13, 1917 she collided with the Pacific Steamship Co.'s GOVERNOR and sank, three miles northwest of Point Conception, California. McCULLOCH was very lightly armed and had little armor. She was not a vessel of war, and could not serve in that capacity. Her main uses with the Asiatic Squadron were showing the flag, patrolling, and serving as a dispatch boat. Complement: 68 Officers and Men, under the command of Captain Daniel B Hodgson; Lt. Foley to 15 July 1898; Capt. C.L. Hooper from 16 July 1898. Clerk of Joint Comittee on Printing, The Abridgement of Message from the President of the United States to the Two Houses of Congress, Washington: Government Printing Office, 1899. 4 vols. (all are documents relating to the war). Ellicott, Lt. John M., "The Naval Battle of Manila", Proceedings of the U.S. Naval Institute, Annapolis: U.S. Naval Institute, 1900. Harris, Lt. Cmdr. Brayton, The Age of the Battleship, New York: Franklin Watts, Inc., 1965. Healy, Laurin Hall, and Kutner, Luis, The Admiral, New York: Ziff Davis Publishing Co., 1944. Naval History Department, Navy Department, Dictionary of American Naval Fighting Ships, Washington DC: Government Printing Office, 1959. Sargent, Cmdr. Nathan, USN, Admiral Dewey and the Manila Campaign, Washington DC: Naval Historical Foundation, 1947. Young, Louis Stanley, (editor), Bounding Billow, August-September 1898 issue. Ship's newspaper, USFS OLYMPIA.